Here’s a rarity – a pair of speakers that Kramer can’t find anything to complain about. They bat above their weight and price, and their sound is energetic, accurate and involving. Read on. ABOUT A DECADE ago, I found myself at a listening evening in Hamilton with a set of the then brand new Halcro monoblock power amps and the pre amp, which at the time were being billed as the best thing ever (dm58 and dm10 models, as far as I recall). They were hooked up to a set of ageing but high-end Infinity speakers, and the system sounded bloody marvellous – a technical term used by audiophiles. It was pointed out to us that the speakers were probably the bottleneck in this particular audio equation, at which point I asked what speakers would be best matched with the amps. The suggestion was a set of speakers from the top end of the Focal/JM Lab range. Since then, with the seed planted, I’ve wanted to hear a set of serious Focal speakers, but it’s just never happened despite my best intentions. There’s a pair from the new flagship Utopia range down in Hamilton that I’ve been invited to hear but until that happens, I thought I’d set the wheels in motion and get a set of the French company’s speakers sent my way. Which explains the arrival of a pair of the Chorus 816V floorstanders. At over $3000, they’re by no means ultra high-end but three grand plus is still a stack of cash for many Kiwi music lovers, and the 816V’s are in a strongly competitive market segment. The 816V’s are certainly distinctive loudspeakers, and that applies both with and without the grilles. Thanks to the input of Parisian design house Pineau & Le Porcher, they’ve got stacks of panache. They’re impeccably built and are constructed with an ultra shiny gloss black acrylic core that runs from the bottom of the front baffle, all the way over the top surface and down to the bottom of the rear panel. This is flanked on both sides by a bevelled and tapered outer panel, finished in this case in an ebony wrap. 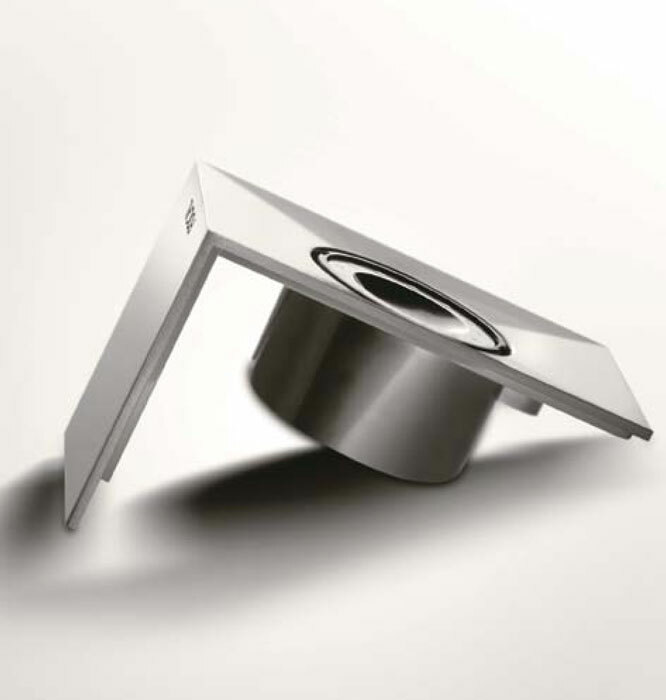 The front baffle also plays host to two silver metal elements, one of which houses the tweeter. Heavyweight separate cast aluminium bases are supplied with the speakers, and they need to be bolted to the bottom of the cabinets during setup. They give the width needed for stability and each side has chunky spikes that come with a small key to make adjustments easy. Floor protectors are also supplied, along with allen keys and polishing cloths. Cabinet material is MDF with a non-parallel inner wall structure and internal bracing. A hard knock on the side indicates that the cabinets are reasonably solid but are by no means resonance free – at the price though, there are no issues in the regard. 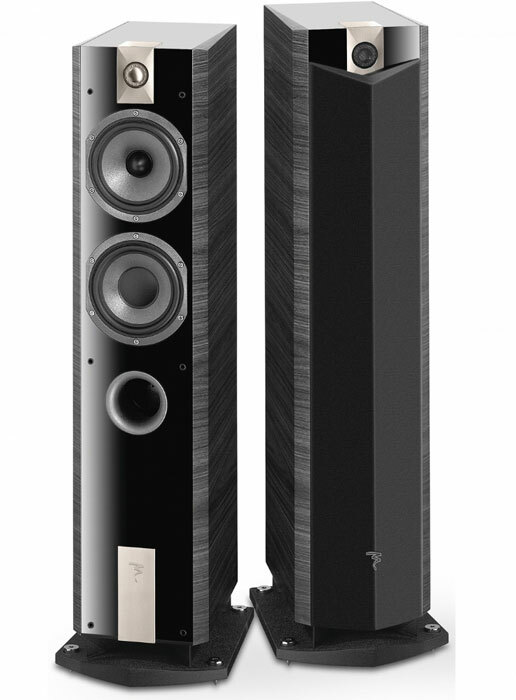 The weight is 22.5kg each and the speaker stand just under a metre tall – 998 x 282 x 375mm (HxWxD) to be precise. Maximum power handling is quoted as 200 watts, sensitivity as 91.5dB (2.83V/1m) and frequency response as 47Hz – 28kHz (+/- 3dB) with a – 6dB extension of 39Hz. Nominal impedance is listed as being 8 ohms, albeit with a minimum of 4.3 ohms at 146Hz. Sans grilles, the front panel is home to three drivers and the gaping mouth of the visible reflex port. A second, equally cavernous reflex port vents through the bottom of the cabinet onto the top surface of the bases, where it’s dispersed into the room. The drivers are a 25mm aluminium/magnesium inverted dome tweeter mounted in its own cast panel, plus two 165mm polyglass units, one running as a mid/bass driver and the other as a woofer. The woofer crosses over to the mid/bass at 300Hz, which in turn hands over to the tweeter at 3kHz. Ports that are big enough to reach into aren’t my cup of tea, but that’s a purely aesthetic complaint, not a criticism aimed at the acoustic efforts of the designers. Initially, there was something disconcerting about staring at that huge hole, but this stopped being an issue after a week or two. For those who aren’t fans of exposed drivers and ports, the 816V’s idiosyncratic but stylish angled grilles run top to bottom but they leave the tweeter bare (it’s protected by a mesh shield) and they actually improve the overall looks of the speakers (hard to imagine I know). Sonically, grilles off is always the best policy but these aren’t too bad because they don’t stifle the tweeter. The Focals arrived in brand new condition, which meant that they needed a good run in. After a few hours of use with no serious listening, I had a chat with Jeff Clark from the local Focal agents, who told me in no uncertain terms that the speakers needed at least 100 hours to really start to loosen up, and that 200 hours was an even better idea. At this point, the speakers were sounding pretty good from the midrange on up, albeit with a touch of harshness at the top. However, the bass was moderately overblown and even a little ponderous. That big front port sounded as if it was lagging behind the woofer, and the woofer wasn’t exactly getting everything right either. Having been down this run-in route over and over, I ignored the speakers and just let them do their thing. A few more hours of play saw things start to come right but after another week of evening listening, and a solid weekend worth of play, the Focals started to sound like a high-quality set of speakers. The top end smoothed out nicely, but more importantly the various bass sources (woofer and ports) found some harmony and began to work together, and to work together well. The Focals aren’t exactly plug and play speakers. Oh you’ll get music from the drivers moments after you wire the binding posts to an amp and hit play, but in addition to the very worthwhile break-in period, these speakers also need some careful positioning to get them to sound their best. Again, this is eminently worthwhile, so persist till you get it right because when you do, these speakers just flat out sound great. The Focals needed more room behind them than most of the similar sized floorstanders I’ve tried, even with the front mounted port. Perhaps this is because there’s that additional downward firing port to consider but at any rate, they excited the room too much and the bass was a touch too fulsome until I got at least a metre of air behind them. They also needed to be aimed almost directly at the listening position for the imaging to snap into focus. The user manual states that the listener has to be at the summit of an equilateral triangle, and even provides a formula for “perfectionists”. I didn’t bother with the arithmetic, preferring to play things by ear to find the optimum position but when I did, the imaging was superb, and not just with the price in mind. The baffles are reasonably narrow but there’s nothing in the form factor to suggest imaging this precise. The phase coherent crossover is probably partially responsible but whatever the cause, the result is mini-monitor level accuracy. The soundstage is decently wide at best but it does go deep, running well behind the plane of the speakers. The Focals were set up with a Marantz SA8260 CD player, StereoKnight Silverstone Balance passive pre amp and Viganoni and Viganoni Sachem monoblock power amps with Slinkylinks and Monster cables – the speakers only support single wire runs. Arguably, the amplification is well ahead of the speakers but the Sachems are very adept at showing up limitations in partnering equipment, particularly transducers. After the long run in period, critical listening revealed that if the 816V’s are anything, they’re energetic speakers that prompt participation. It’s tough to play music with a real beat without being drawn right into the performance, complete with tapping feet and my trademark silly grin. For example, the percussion that runs strongly over ‘Carnival’ from Natalie Merchant’s Retrospective 1995-2005 CD had impressive scale and depth, along with excellent attack on the leading edges of the strikes. The different textures and sounds of drum and percussion were well defined, with a substantial feeling of weight and tautness to the air movement in the room. The track moved along well, buoyed up by the power and speed of the bass notes, but the speakers were easily able to render the rest of the performance at a similarly accomplished level. ‘Sally Ann’ (track 13 on the aforementioned Natalie Merchant disc) is a great test track, and not only because of the quality of the recording and the startling clarity of the vocals, but also because of the sheer intensity of the screechy violin and the masses of high frequency energy laced through the song. At higher volumes, overly bright or harsh hi-fi systems, or speakers for that matter will basically force the listener to reach for the remote control to cut the levels. With the Focals, this recording had me wandering over to my preamp (no remote control of course) and cranking the dual volume knobs a little further around the dial in a clockwise direction. And when you do run the Focals hard, they respond to the power. Not that they need much, mind you: the claimed 91.5dB sensitivity seems to be about right, so they go loud without having to be fed by an arc welder, but they hang together strikingly well when the taps are open without lapsing into compression or becoming unforgiving. The Focals just kept getting better and better as I listened to them. The detail levels went from good to excellent as evidenced by a session with Van Morrison’s The Healing Game CD – I was settling in to load some articles on the site when ‘The Burning Ground’ kicked in and the openness of the sound and the abundant textural information of what I was hearing made me look up in something approaching shock. For a second I was confused to see a set of black rectangular speakers in front of me instead of my usual Rimu grain Theophany M5’s. Not in terms of character, more in terms of perceived value – at that point, I hadn’t quite gotten my head around just how good the Focals could sound. Build quality is excellent all round. Okay, so their metal inverted dome tweeter will never be quite as smooth as the M5’s silk dome and it’s not as revealing, but at the price point, it’s an over-performer. It’s a fresh unit for Focal, with a newly developed alloy used for the dome, a new foam surround and a revised neodymium motor. All these changes are said to cut distortion by a factor of three at 1000Hz, and by six at 500Hz, and it certainly does sound good. Those who are used to a soft, rolled off top-end might classify it as bright. It’s actually not. It’s best described as explicit – you’ll be left in no doubt as to the nature of a set of well recorded cymbals, like those captured on ‘The Street Only Knew Your Name’ from the Van Morrison’s The Philosopher’s Stone CD set, which are sharp and intense. There’s no sense of belligerent brightness or harshness –at least with my system in front of them. What these speakers do for the guitar, vocals and horns on this track (particularly at around the 3:20 mark) is a showcase of what can be done at the price, and the treble is a big plus in that equation, not a minus. In addition to the excellent tweeter, the two bigger drivers also put on an outstanding show. In fact, the multiple drivers and ports combine to form a remarkably coherent and tonally balanced sound, assisted no doubt by the crossover, which uses Focal’s Optimum Phase Crossover technology. Crossover design is an area that Focal claims as a particular in-house strength, and that certainly seems to be the case here – listen to ‘Stepping Out Queen’ from The Healing Game and like me, you’ll probably marvel at the way Morrison’s vocal is placed solidly in the centre of the soundstage behind the speakers, and be captivated by the sheer resolution coming from what in audiophile terms are relatively humble speakers. Listening to The Cream Of Clapton (Eric Clapton’s 1994 compilation CD) proved to be an interesting exercise as the Focals easily revealed just how wildly different the production values are on these recordings, spread as they are across 15 years and multiple studio environments. The high-resolution sound gave the better recordings a real sense of depth and clarity, especially when it came to dissecting the backing vocals and multiple instruments, which is something these speakers did with aplomb. However, even the harsher tracks weren’t left hanging – they still proved enjoyable and entirely worthy of multiple listening sessions over the weeks. The quality of the 816V’s bass is interesting – the low frequency extension feels and sounds a lot lower than Focal’s claimed figures would lead one to believe. These speakers are theoretically 6dB down at 39Hz but they carry loads of weight at the bottom, and it’s by no means a flabby kind of weight. Once the ports and the woofer started cooperating, the bass was tight and tuneful, with the impact that gives drum kits and bass guitars the kind of palpable whack that’s essential to good dynamics and realism. The low end also integrated well with my room (as long as there was enough space behind the speakers), and room nodes were well controlled without as much of the position-dependant bass peakiness that I often experience with other speakers. This is probably a result of design not accident because Focal’s intent is that the two ports each do something slightly different but add up to be more than the sum of their parts. So, after 10 years, I’ve finally wrapped my ears around a pair of Focal loudspeakers, and it was well worth the wait. These are seriously good speakers, so good in fact that I can’t find anything to complain about. I’d usually grinch on about the fact that they’re wrapped in vinyl, but they look so damn good, are built so well and sound so superb that this seems churlish and petty. All up, it’s fair to say that these speakers aren’t from the warm and cossetting school of speaker design. They major on fun, are big on exuberance, even at lower levels and they’ll never be boring – trust me, your feet will tap when these puppies are playing but strangely enough, not everyone will like that much energy. They’ll bring out a great deal of musical detail without getting carried away with the process, and they reach low enough to be real all rounders. Then there’s that imaging to consider, and the fact that they’re reasonably easy to drive and quite sensitive. What we have here is basically an embarrassment of riches – and after many happy hours listening, I still found them to be capable of surprising me with their sonic skills. A late Friday night with the first disc of my treasured CSN&Y box set is a case in point – when the SACD player’s random programme cued up Neil Young’s ‘Helpless’ and the Focals made it sound simply beautiful, I was once again struck by that old law of diminishing returns, and it occurred to me that these speakers would be money well spent. great review. When I was with AV World Jeff left us a pair for evaluation, at the time I wasn’t looking for speakers currently owning a pair of Dynaudio Contor 1.8 MK11 and a set of Image 414 MK11 as well, both in different systems, upon fist hearing the Focal 816V ‘s I immediately though WOW here’s something special at an affordable price so took them home for the weekend. Come Monday I was on the phone to Jeff telling him what a naughty person he was and begging to buy them. Over the next two weeks they improved out of sight and have replaced both the afore mentioned speakers. Their high sensitivity allowed me get stunning results from my tweeked Ticorp 35se valve amp. They sound so good I’ve long forgotten that they are only MID PRICE speakers. 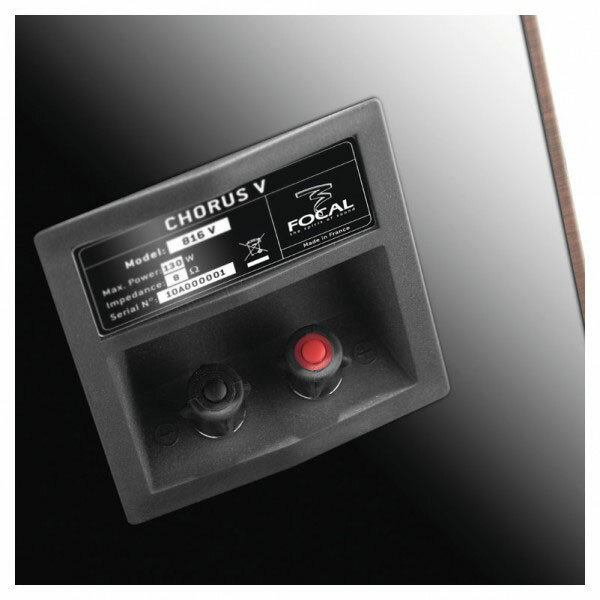 It was interesting to read your review article of the Focal Chorus 816V which accidently saw. I have the previous model for now several years,these without V, but I fully agree on your impression of these marvolous speakers.At this pricelevel you never could thougt they would perform so well.I first intend to have some cheap speakers to my Television sound but when I hooked them up in my stereo with tube amp Audio Research VT100 they suddenly bloom out ! so I keep them there ! There is one thing;maybe I would like to have a smoother treble.a change to a beryllium dome tweeter if it is possible.